The first Latino business in Wyoma Square could be a sign of growth to come in the area, say city and business officials. Juana Morillo, a longtime hairstylist and business owner in Lynn, opened Tanairy Beauty Salon last week in Wyoma Square. The full-service salon with brightly painted walls sits on busy Broadway, right next to The Lazy Dog pub, and is the first of its kind in the area. 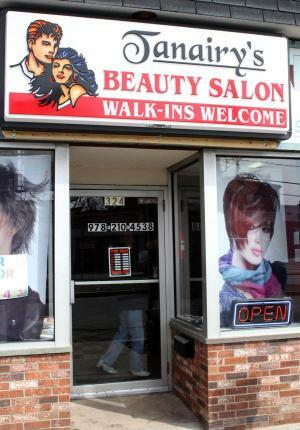 Morillo had been looking for a new place to open shop after her Chestnut Street beauty salon burned down four years ago. She said she thinks the time was just right to begin again in a new market. "I think Wyoma Square was the right place to open up," she said, explaining she has a diverse clientele she's gained from her years as a bilingual hair stylist and hairdresser instructor in the area. City and state officials seem to agree, as everyone from State Rep. Robert Fennell and Lynn Mayor Judith Flanagan Kennedy attended Morillo's ribbon cutting March 9. The success of her business, and others like hers, depends simply on supply and demand, said James Cowdell, the director of the city's Economic Development and Industrial Commission. And right now, Lynn has a high demand for Latino services, he said. "Lynn's a very diversified city, so it makes sense that where we have a high Latino population, we're going to have a high population of Latino businesses," he said. He said he's not sure whether there's a trend for those businesses to branch out of traditional Latino neighborhoods, but the commission has doled out loans averaging $40,000 to half a dozen Latino businesses in as many months. That's a much higher percentage than any other ethnicity, he said. Latino business owners aren't limited to downtown or West Lynn anymore, said Frances Martinez, the director of the North Shore Latino Business Association and an integral part of helping many new businesses like Morillo's open up. "We are contributing with the economy, we are opening opportunities for the city and we just want to provide our services anywhere," she said. In Wyoma Square, Morillo said business has been good so far, and she thinks once word gets out about her services, it will be even better. "I believe they're going to love my work and my environment," she said. Morillo has been something of a trendsetter. She was one of the first Latinos to open a business in the Chestnut Street area in the '90s. And she's working with Martinez to open a Latino beauty academy on the North Shore, which would also be a first for the region. Morillo said she's confident she's setting an example for other Latino businesses looking to break into the "mostly American" market in Wyoma Square and other parts of Lynn. "They love to follow people," she said. Amber Parcher can be reached at aparcher@itemlive.com.